Bryce Gibbs can only be picked as a MID in 2014 as is new recruit Dale Thomas. 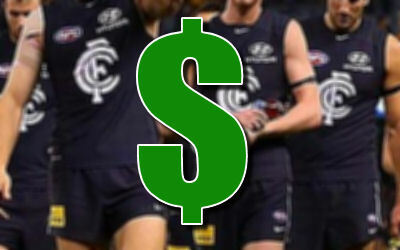 Read on for the Carlton prices and positions. In 2014 Bryce Gibbs ($481,500) can only be selected as a MID. While he’s still a bargain, Dale Thomas ($346,400) is just a MID. Will you still go there? Marc Murphy ($463,500) is worth a look in after a poor season this year. I am a little disappointed that Dale Thomas has lose his DPP and now is just a straight MID. I should have known as soon as the guy from Champion Data would not answer there question on Dale Thomas. With Daisy in the mix and higher on the tagging order I think Walker and Simpson in the back like looks a real treat. Daisy will score more than 64 points per game. Not sure how high up the tagging order he is. I think there are few players ahead of him. Murphy, McLean, Gibbs and even Judd. How keen is everyone on Murphy? Can average 100+ but can get tagged out of matches.